The National Space-Based Positioning, Navigation, and Timing (PNT) Advisory Board will meet in Arlington, Virginia, on Thursday, June 9 and Friday June 10. The sessions are open to the public. Among the agenda items are GPS modernization, interoperability with other GNSS systems, and future challenges to PNT service providers and users, such as protecting the emerging role of PNT in cyber networks, including the need for backups. The meeting will be held from 9 a.m. to 5 p.m., Thursday, June 9, and from 9 a.m. to 1 p.m. on Friday, June 10. Venue for the gather is the Sheraton Crystal City Hotel, 1800 Jefferson Davis Highway, Crystal V and VI rooms. Seating capacity is limited. The National Space-Based PNT Advisory Board is a federal advisory committee comprised of experts from outside the U.S. government that provides counsel to the National Space-Based PNT Executive Committee and other government agencies regarding the nation’s space-based PNT policy, planning, program management, and funding profiles in relation to the current state of national and international space-based PNT services. 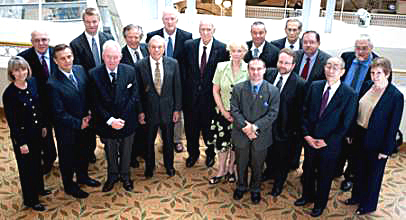 James Schlesinger, chairman of MITRE Corporation and former secretary of defense, chairs the group; Brad Parkinson, Stanford University professor emeritus and first director of the GPS Joint Program Office, serves as vice-chairman.